New statistics from Allianz Insurance reveals that 5,061 windscreen and body glass claims were made in 2016. The vast majority (86 per cent) of claims were made for windscreen damage, while 9 per cent were for body glass and a small portion (4 per cent) of claims were based on rear glass damage. The top three causes of glass damage reported to Allianz last year included stones on the road which damaged 78 per cent (3,955) of vehicles, acts of vandalism damaged 9 per cent (449) of vehicles and road accidents caused damage to 5 per cent (228). 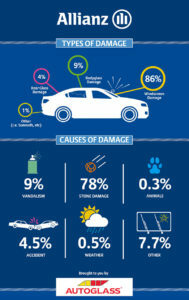 A small amount of glass damage to vehicles last year was linked to animals (17 claims). The main cause of windscreen damage according to the Allianz stats were stones on the road which damaged 3,768 vehicles in total. In contrast, the primary reason for damage to both body glass and rear glass was vandalism – 307 body glass claims and 85 rear glass claims were reported last year.